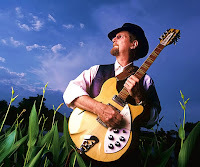 As I mentioned in an earlier post, I'm a fan of Roger McGuinn's Folk Den, a personal project he's undertaken since 1995 to keep the folk legacy alive. McGuinn records a folk song per month and offers them as free downloads via his McGuinn.com site. If you like that one, check out McGuinn's other videos for the GrowingBolder.com site: "Roger Rocks on Rails," "Mr. Tambourine Man," and "How a Childhood Gift Changed Music History." There's also an hour-long audio interview with Roger on the site. All well worth checking out.